By Sara Mahmoud – New Economics Foundation: The rapid growth of land wealth has been driven by financial speculation. Figures released today by the Office of National Statistics show that UK wealth grew nearly 10% during 2016. The largest rise on record, this puts the UK’s total net worth at £9.8 trillion. 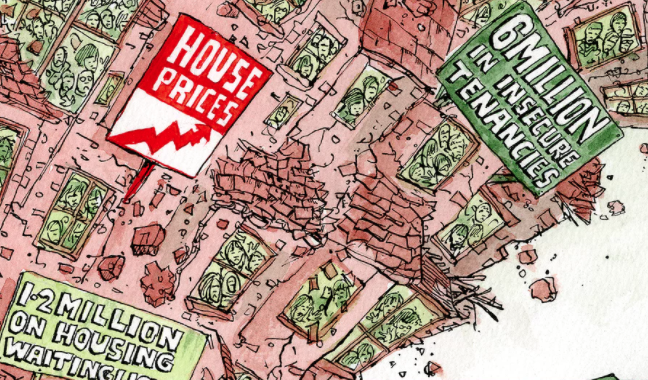 But far from being the kind of growth that will help people, it is one of the trends exacerbating inequality and making homes less affordable. Since the financial crisis, land wealth has grown nearly twice as fast each year as wealth held in machinery and equipment, and eight times faster than wealth held in intellectual property – debunking the idea that the UK’s economic growth is driven by jobs or innovation. Instead, today’s release reveals that land wealth, which accounts for half of the UK’s wealth, rests on shaky foundations; generated not by a productive and innovative economy, but by financial speculation. This is the latest in a long line of wake-up calls which demonstrate the urgent need for reform of the way land and housing works. Instead of selling off land, the government should be making the most of it. We need greater control over how wealth associated with land is generated and used. To prioritise people’s basic needs over headline figures and the profit of private developers, the government must halt the public land sale, and instead support a People’s Land Bank– retaining land for public or community ownership and the development of homes suitable to community needs. And it should strengthen compulsory purchase powers to help retain land value rises for public benefit. Will Brett – Director of New Economics Foundation: The government’s fire sale of public land is fuelling Britain’s housing crisis, according to research by the New Economics Foundation. Fresh analysis of recently published government statistics reveal that only one in five of the new homes to be built on public land sold off in the last six months will be classified as ‘affordable’. Even this figure is optimistic as it uses the government’s own widely criticised definition of affordability. As little as 7% of new homes are likely to be social housing, and in some cases developments comprise solely of luxury properties. The research also shows that new homes on formerly public land are taking far too long to build. At the current rate, the government’s target of building 160,000 homes by selling off public land will take until 2032 to achieve, 12 years later than promised. The government’s approach to boosting housing supply by selling off public land does not do anything to address the fact that developers are incentivised to build slowly and set prices high. And as more land is sold, the opportunity is missed to plan and build the types of homes that people want and can afford. By halting the sale of public land, the government could instead empower communities themselves – along with local authorities, small builders and institutional investors like pension funds – to provide more affordable, better quality homes. Community-led and social housebuilding projects with homes to rent and buy not only get the most value out of public land but also give people more control over their surroundings. Previous NEF research revealed that community-led affordable housebuilding projects on just ten public sites due to be sold off could save £231 million in housing benefit payments over 30 years. These investments could start to make a return for the public purse within 20 years, all while alleviating severe housing need across the country and putting communities in charge of their own housing provision. “The government’s fire sale of public land is failing by its own measure and making the housing crisis worse. This irresponsible approach is bringing to market a slow trickle of property that few can afford. Every day, people are finding it harder and harder to find an affordable place to live. Next week the Chancellor could help people take real control over their lives by putting an end to this land sell-off. Homeownership is at its lowest levels since the 1980s as both house prices and social rents continue to rise faster than income growth. Government interventions to help first-time buyers have worsened the affordability crisis by inflating house prices by up to £8,250 per property. As most people cannot afford to buy now even with a mortgage, cash buyers such as second homeowners and buy to let landlords are propping up the market. By far the biggest portion of government spending on housing goes on the housing benefit bill which costs £21 billion each year. Meanwhile there are over 70,000 households in England living in temporary accommodation, up from 48,000 in 2011.